Every Spring, people in Jukkasjärvi in northern Sweden harvest 5,000 tons of ice from the nearby Torne River and keep it in storage until November, when it is used to create the ICEHOTEL made entirely of ice. The walls, floors and furniture are ice. 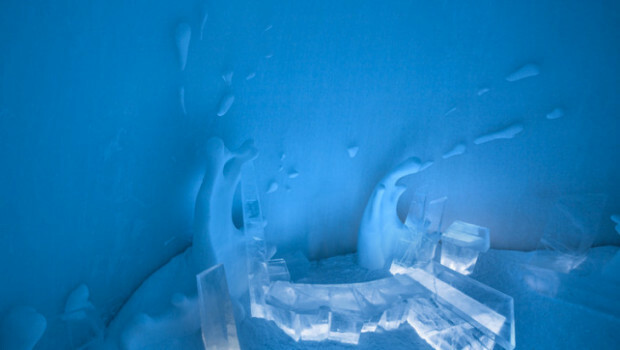 Even the glasses used at the iconic ICEBAR are made from ice. The hotel opens for business in mid-December and closes in mid-April, when all that ice is dismantled and returned to the river. 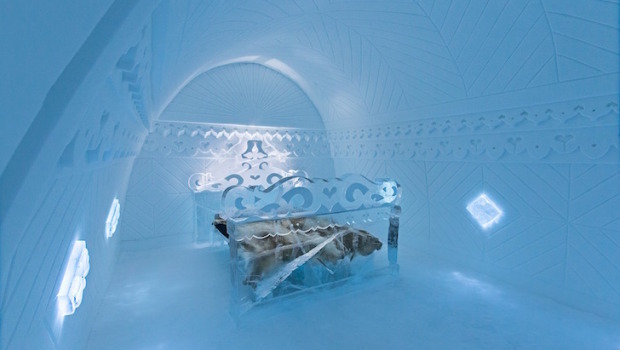 The ICEHOTEL features 61 rooms, an ice bar, restaurant, main hall, reception area, and a special 25th anniversary edition ice theater. 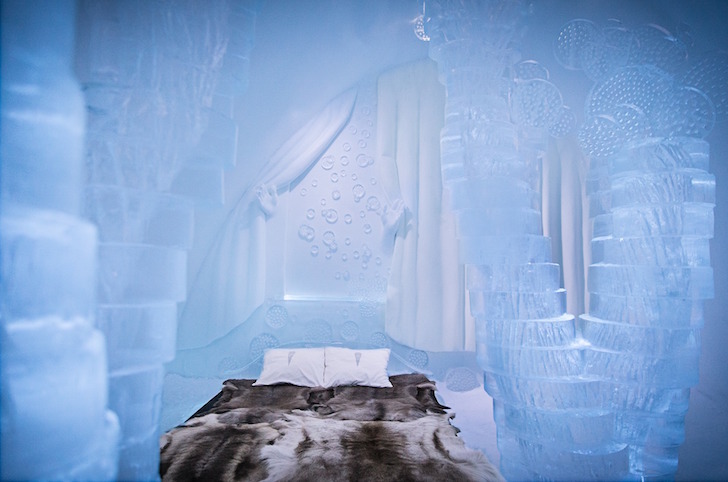 Designated Art Suites are individually designed by artists who craft unique designs into the ice. One of the favorites this year is a rain forest landscape with orangutan snow sculptures. This year’s ICEBAR is called BOOOM! and is the work of sculptor Maurizio Perron from Italy, architect Viktor Tsarski from Bulgaria and Wouter Biegelaar from the Netherlands. 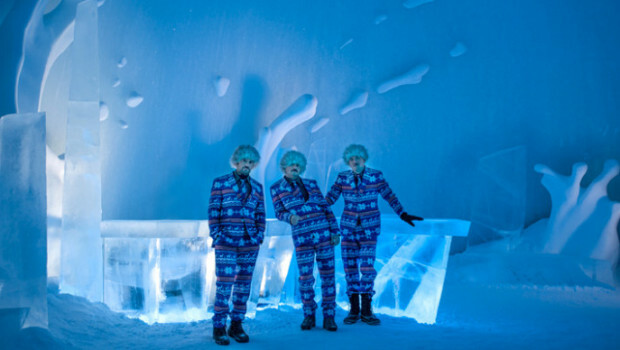 “We wanted to celebrate the 25th ICEBAR, the heart of the ICEHOTEL, with a big bang. BOOOM! is an ice explosion where sharp ice blocks shoot through the dome. Where the ice clashes to the wall, waving splashes of snow appear,” they told the world. After viewing the arctic lights and drinking at the ICEBAR, it’s time to hunker down for the night in your room, where the temperature is a balmy 25 degrees F. Fortunately, guests are treated to the very finest in Arctic quality sleeping bags and an Arctic survival guide. After a night on ice, they each receive a diploma and access to a warmer room. 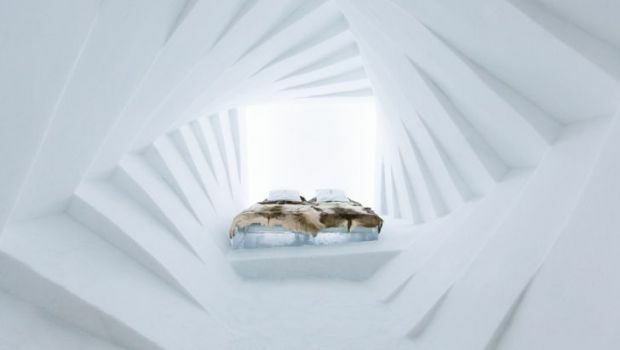 Jukkasjarvi is a tiny community of just 1100, but every year the ICEHOTEL brings 50,000 tourist to the area to see one of the most unique hotels in the world.